LASIK Combines the accuracy of the Excimer laser with the quick-healing characteristics of a procedure first performed in 1949 called Lamellar Keratoplasty. The primary difference between PRK and LASIK is that the surface of the cornea is treated with PRK while the inner tissue of the cornea is treated with LASIK. Both have similar success rate, but LASIK offers patients less postoperative discomfort and quicker return to functional vision. During the procedure, a special device creates a hinged flap of thin corneal tissue, and the flap is gently folded out of the way. The laser reshapes the underlying tissue, and the surgeon replaces the corneal flap over the treated area where it bonds securely, without the need for stitches. With less surface area to heal than PRK, LASIK patients recover very quickly, and most experience little, if any discomfort. Functional vision returns very rapidly, with the majority of patients seeing well enough to drive in a day or two without glasses or contact lenses. Most patients elect to have LASIK performed on both eyes at the same time. To be a good candidate for LASIK, the cornea must be of sufficient thickness to allow for the flap to be made and still have tissue under the flap to allow for proper amount of tissue to be removed to achieve the targeted level of correction. Patients with severe dry eye syndrome, very thin corneas, or other conditions, such as the beginning stages of a cataract, may be better candidates for other refractive procedures. 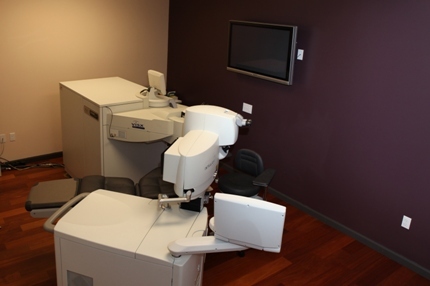 At Northern California Laser Center, we have the most advanced equipment in laser vision correction. We use the IntraLase femtosecond laser to create the LASIK flap as compared to the metallic blade microkeratome commonly used at most LASIK centers. Additionally, we use the Visx Star S4 IR, to reshape the cornea for the desired prescription. The IR stands for Iris Registration which brings greater safety and accuracy to LASIK eye surgery. The combined technologies, CustomVue, IntraLase LASIK eye surgery with Iris Registration is called iLASIK. The iLASIK procedure the only procedure approved for TopGun Pilots and NASA Astronauts. Read more under CustomVue and IntraLase pages for more explanations of the technologies. Here are Ultra high resolution images of the front part of the eye taken by the Visante Anterior Segment OCT (Optical Coherence Tomography) made by Zeiss. This patient had iLASIK eye surgery. Please note how the central portion of the cornea is thinned and relatively flattened compared to before LASIK. That is how the focusing power of the cornea is changed for this near-sighted patient. Above -- Visante Image After LASIK -- Central portion of the cornea is now thinner and relatively more flat. 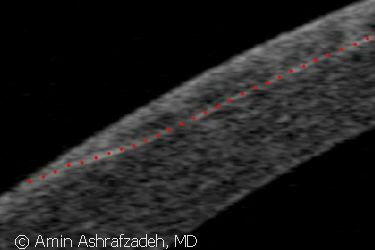 This is how the Excimer laser reshaped the cornea for this myopic (Near-Sighted) patient. Above -- Visante Image showing the LASIK flap. 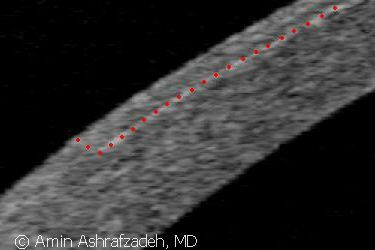 You can measure the thickness of the corneal flap (top portion in the image and the top number) and the residual stromal bed (bottom portion in the image and the bottom number). Want to know more about the amazing LASIK Technology? The LASIK Eye Surgery Suite at Northern California Laser Center, Modesto, CA. All our LASIK surgeries are performed right here in the Coffee Road office.